This is my personal ‘2nd home’ station, as I’ve got family that live close by. Shout-out to Bayview Village! Serving almost four times as many passengers daily as its lonely neighbour Bessarion, Bayview nevertheless feels capacious and overbuilt—ridership is fairly anemic at this stop. There’s probably enough empty space to play a kid’s pickup soccer game in the mezzanine. But I guess I don’t mind. Bayview features the playful artwork of Panya Clark Espinal. Her installation, From Here Right Now, consists of 24 everyday objects projected onto the station surfaces using waterjet-cut porcelain tile and custom terrazzo. The drawings appear distorted from most angles, spilling over corners and floors, but ‘pop’ into satisfying proportionality when observed from the right perspective, an optical effect known as anamorphosis. From Here Right Now is a largely successful piece of public art. Even though the hand-drawn images are cheap-looking and simplistic, I was thoroughly engaged as I moved through the facility squinting, squatting, and stretching while trying to puzzle out the viewing angle to reconstitute each particular projection. A sense of exploration and viewer interaction pervades the station as a result. That is to say, even though I don’t like the art, I do like the art. Espinal also won the commission for the new Downsview Park station on the Toronto-York Spadina Subway Extension; I look forward to seeing what she comes up with when that line (eventually) opens. Opened on November 24, 2002 as part of the Sheppard line, the station was designed by Stevens Group Architects. 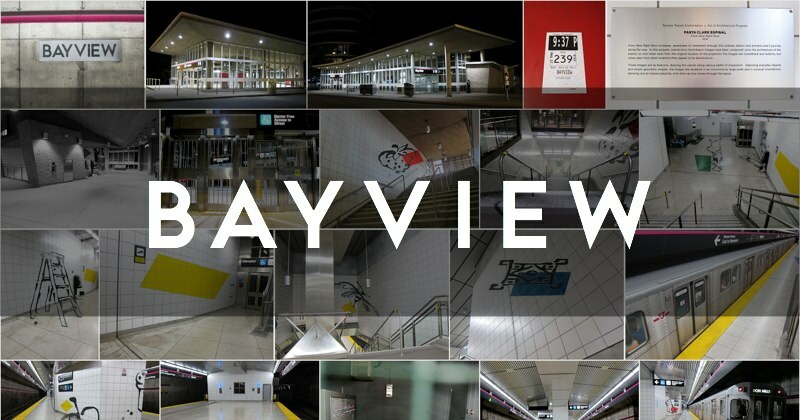 It notably lacks a direct connection to the Bayview Village mall, whose commercial owners infamously resisted a direct connection to the subway, claiming that their target demographic wouldn’t travel there by transit. Fair enough, but still a moronically insular perspective.